This variation of a quote by computer scientist Alan Kay was the last line of a 1994 job listing written by Jeff Bezos, and still holds true to this day. While Redstage’s team of forward thinkers possess a knack for accurate predictions, we’ve also helped shape the future of ecommerce through our mobile research initiatives. #2. What Technology Will Have The Biggest Impact On Marketing In 2018? #3. The Mobile-First Holiday: Ecommerce Stats You Need To Know! Top Case Study of The Year! Check out our most viewed case study of the year: White Mountain Footwear. If this were a blog post, it would hold the #3 spot above! Top Download of The Year! 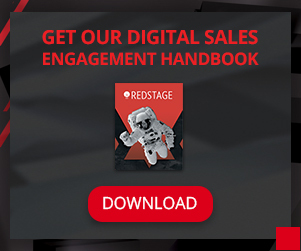 Take a look at our Digital Sales Engagement Ebook, our most viewed downloadable of 2018! Discover all the tools you can use to optimize your digital sales team and top tactics to revolutionize your digital acquisition strategy. Can’t find info on a specific topic? Send us a message and we’ll help you find it, or we’ll add it to our content schedule! Our team of researchers and thought leaders are always looking for ways to best serve our readers. Visit our blog page to subscribe! A sustainable firm needs loyalty customers – this is undeniable. Over the last century, retailers have been using reward programs as an effective tool to gain more repeat customers, and from this, build customer loyalty. However, the fourth industrial revolution is coming and the perspective on loyalty programs is consequently different. Marketers and business doers today realize the importance of AI and Big Data in determining repeat buying behavior. Hence, to take advantage of high technology in loyalty programs catches online retailers’ attention and requires a lot of intellectual and financial investment. Customer loyalty programs should be perceived as a campaign designed to build and preserve interaction between clients and brands, not just to increase revenues. From this new standpoint, apart from investing in a powerful reward program, customer experience and satisfaction will become an increasing concern for businesses. There should be additional methods to form higher customer retention, which requires the application of technology, especially artificial intelligence (AI) and Big Data. Interestingly, 2018 may be the year which marks an outburst of AI in general and AI application in customer loyalty programs. This is represented through the figure of NewVantage Partners’ annual executive survey conducted within Fortune 1000 corporations which shows that a very large proportion, 97.2%, of these organizations are investing in AI and Big Data even though the levels of investment is being kept low. Also, according to the BPR Consulting research in 2017, nearly half of retailers would utilize AI to improve CX, and 55% would plan to focus on increasing customer loyalty within the next 3 years. In addition, according to Accenture, customers today tend to be enticed by programs or deals which are tailor-made for their personal needs, as they favor personalized rewards and specialized care. This, as far as I’m concerned, cannot be done without AI-based tools. These facts raise a big question to marketers: How to deploy AI in building customer loyalty programs in future? There are quite a lot of arguments among experts about the term AI, also known as Artificial Intelligence. In 1956, John McCarthy explained AI as science and its application to making machines, especially computer programs, which are considered smart. These intelligent machines are able to perform some tasks as a human being would. To clarify, they are able to recognize speech, learn, make plans and solve problems in the way a human does. In this early stage of AI development, people both doubt and fear its potential power in the future. However, for a marketer or an e-retailer, there is no choice but to accept and prepare for its upcoming presence in every single aspect of business. Artificial Intelligence is no longer a foreign concept to most people nowadays, especially in e-commerce. Customers are now used to receiving personalized emails, being greeted by their names and being offered customized services. According to Chiefmarketer, buyers are, in fact, totally okay with their personal information being collected and analyzed, at an appropriate and considerable level, to get better discounts, more precise recommendations and more personalized services. Such services are what shopping doers are expecting from online retailers without any awareness of what AI is. However, we marketers have to start keeping a close eye on it from now on. The term Big data refers to data sets which are extremely large, so large that traditional methods of data processing are unable to handle them. We usually get Big data when collecting information from sources such as videos, audio, social channels, log files, websites and networks which are literally created in real time. Big data can be used to help computers analyze patterns, trends and associations which are often related to human behaviors and interaction. Big data contains information which used to be left untouchable, and by analyzing this data, we are able to make better and faster decisions. Buyers are becoming more difficult about what they purchase and how they are served in your online stores. Most importantly, customers’ expectations of the personalization in products and services increase as the customer-centric culture is spread among big companies like Amazon. From this, I know that the one-size-fits-all era has ended, that mass-production is no more than an old-fashioned trend and that free-size jeans are being replaced by personally-designed ones on the shelves. Big Data powered AI systems have made a big step in analyzing and understanding customers’ needs. Now, you are able to collect necessary information and track customers’ purchasing history, shopping behaviors and preferences. Based on these ‘big data’, AI learns and makes a decision to timely offer buyers a personal touch, tailor-made products and personalized services. Not only is this about sales or conversion rates but also customer loyalty. By deploying AI, customers really get that attention which they crave for today. They know that their problems are heard and solved personally. Also, they get extra benefits when shopping at the store. This is a major factor to retain buyers in this digital era – the era of global shopping just with a few clicks, also the era of commitment and loyalty being difficult to gain. Bombfell deploys AI to help their stylists pick individually suitable outfits for their customers can be a simple example for the era of personalized services. With AI, user experience in an online store is optimized at the highest level. Customers, thanks to this, find themselves cared for and feel important. Besides all that, AI will develop to the level that customers can comfortably communicate with online stores through chatbots. Hence, the response time will be sped up to tick-tocks. Algorithms are developed to enable machines to think like human beings and even to understand customers’ emotions in order to perform appropriate actions. Not only solving problems quickly, AI also helps to replicate a human-like communication atmosphere. Customer satisfaction and personalized experience combined with tailor-made services are the key points in showing buyers that they are highly appreciated by the brand and consequently in laying a great foundation for building customers’ trust. This is the fundamental of cultivating customer loyalty. As mentioned above, customers are willing to share their data for a better price, customized services or more convenience. However, worries about privacy and information security are still very much real, and they form a barrier between customers and brands in building trust. Shoppers, on one hand, understand that their data is collected and love the benefits coming from it. On the other hand, they question about the level at which their personal information is exploited and how it is used. Is their data safe when AI is that powerful? Are e-retailers able to protect them from frauds and identity theft when cybercrime is increasing? To win customers’ trust is a big challenge that e-commerce websites are facing in building customer loyalty. Personally, I will definitely leave an online store which gives me doubts about security. For example, as a travel lover, I used to make a room reservation online on a well-known hotel booking site; however, one day, I was warned that this website leaked customers’ confidential information including credit card number, CVC and expiration date. Even though there was no frauds or misuse of the data recorded, I decided not to give this brand any second chance. So make sure you provide your customers an optimized security solution, and more importantly, make a big commitment to providing the highest level of customers’ safety and privacy. They need to feel peace of mind by knowing that their data has always been and will only be used to improve their shopping experience and to give them personalized offers. Big data is actually not difficult to be collected, yet it is hard to be captured, organized and analyzed. Different sources of data are always ready to be deployed but remain unused due to lack of structure and technical know-how. The biggest challenge here is how to, through AI, really understand data and to have an overview of it while too much information comes from various sources such as invoices, emails, social media and CRM. Also, how to turn big data into patterns, trends or associations which are useful for marketing activities and customer insights in real time is extremely important. Just like other actual personal relationships, that customer loyalty is built on trust, the consistency of high-quality services to buyers and unchanged commitment form a long-lasting relationship. That e-retailers are considering applying AI in building customer loyalty shows their dedication to it in spite of many difficulties. The development of AI and Big data, in recent years, has given online retailers both opportunities and challenges. In the next decade, digital stores will be equipped more optimized tools based on AI, and through this, they are empowered to strengthen customer relationship and enhance customer retention. This is a technology competition and I believe that the one who wins the game will also win the customer’s heart. Summer reads and writes blogs about marketing and e-commerce. She’s especially interested in solutions which help merchants improve their customers’ shopping experience and increase customer engagement for Magento 2. “One of the best ways to enhance user experience on an online store is to provide a better Layered Navigation” says Summer.